This year, Mother’s Day is May 10 and if you don’t already have a plan in place to reach out to your customers by email, it’s not too late to get started. • There are 85.4 million moms in the U.S.
• The average American will spend $168.94 on mom for Mother’s Day. • 28.5% of Mother’s Day gifts are bought online. With stats like that, you’ll want to kick your email marketing into high gear. We recommend that you start marketing at least two weeks before Mother’s Day to make the most of it. Research by Experian found that 80 percent of email-generated revenue occurred in the 11 days leading up to Mother’s Day and on the holiday itself. Who doesn’t need a little gift inspiration now and then? Help your customers by offering gift ideas. Whether you highlight your main product or create a gift guide, you should showcase gifts that mom’s would like. Think about organizing your gift guide by interest, style or price points. If you need help creating a gift guide, check out this post that walks you through the process. Gift guides are also great to share on image-centric social sites like Pinterest and Instagram. With sales on the line, it might be a great time to try out using Promoted Pins and see if they translate into revenue for you. Use email to invite your customers to an event, class, sale or contest. Contests can increase customer engagement and increase visits to your brick-and-mortar store or website. A florist could have customers post photos of their mothers on the store’s Facebook page for a chance to win free flowers. A bookstore or kitchen store could hold a Mother’s Day recipe contest for a free cookbook. Local retailers could also invite customers out to a mom-themed sale or event. Clothing shops can run a Mother’s Day sale, a local spa can host a mother-daughter event. If you plan ahead, you can organize a class that focuses on Mother’s Day. Hobby stores, for example, can invite customers to a craft class to make a gift for their special someone. Be sure to include all of the necessary details in the invitation email that you send. People tend to wait until the last minute to buy gifts, so give them a nudge with a last minute email. Sweeten the deal with a promotion. Use clear messaging in your subject line to indicate that time is running out on a certain deal, a limited item or free shipping. Whatever the enticement, put your offer right in the subject line to make sure recipients open the email and take action. Take a look at the example below. This retailer creates a sense of urgency and offers an incentive to get subscribers to act. When Mother’s Day rolls around, send an email that celebrates the holiday. There’s no sales push, just an acknowledgment of appreciation. You could send this email to everyone on your list, or just those who made a purchase. If you send an email to those who made a Mother’s Day purchase, be sure to thank them as well. 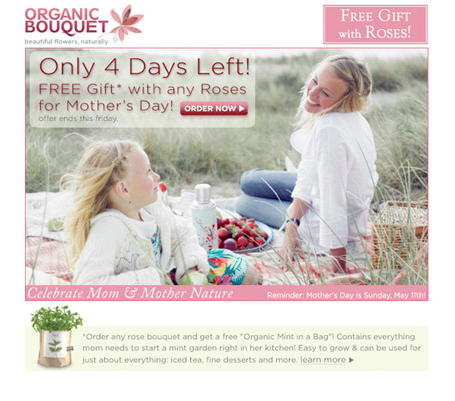 How will your business utilize email marketing during Mother’s Day this year? Tell us in the comment section below.